The tagline, “just when you thought it was safe to go back in the water” is a bittersweet one for marine conservationists. It belongs to the second Jaws movie, a franchise that has since been “credited” with contributing to the justification for a government-led shark cull in Australia , as well as a shark hunting trend that has led to population falls of over 50% for some shark species on the east coast of the USA . However, in the tourist resort of Playa del Carmen the flip side of the Jaws effect is on show. ‘Playa’ is one of several locations globally where a fear of sharks has been replaced by a fascination. Recent research has shown the majestic fish to be worth almost 18,000 times more alive than dead . Scuba divers are now flocking to the Mexican city just to see the local bull sharks up-close-and-personal, fuelling a multi-million dollar ecotourism industry [4,5]. So, why then, is the Jaws 2 tagline still concerning marine conservationists working in the Playa del Carmen region despite the resort’s shark population being well protected and in good health? The simple answer to this question is water pollution. Researchers from Cardiff University are currently leading Land2Coast, a 15 month project investigating the impacts of land use on the Mexican coastal zone, including that in Playa del Carmen. At almost every opportunity, local environmental leaders and residents of Playa involved in the project have told the Land2Coast researchers that poor water quality ranks #1 of the conservation issues in the Playa region, because of its impact on both human and environmental health. At two Land2Coast project workshops in March 2017, municipal leaders, water authority employees, protected area managers, heads of non-governmental organisations (NGOs), and tourism industry representatives were asked to map the land use issues most impacting their jurisdiction. Published in a recent Land2Coast project report , these maps (below) show that wherever there has been urban growth around a tourist centre (e.g. Cancun, Tulum, Playa del Carmen) then untreated effluent has entered the ocean. The workshop attendees conveyed that as little as 30-40% of wastewater is treated at all in the state of Quintana Roo, where Playa and the other named resorts are located. 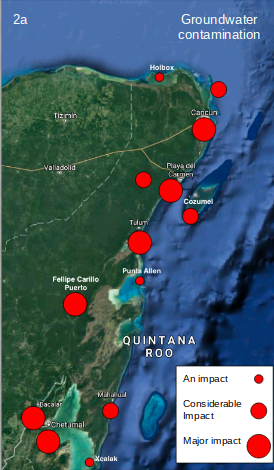 During fieldwork this May, the Land2Coast researchers then heard about the significance of the polluted water entering the ocean along Playa’s coastline in interviews with marine tourism workers. One dive shop worker, noting that they themselves no longer went swimming along certain parts of the shoreline for the sake of their own health, described how tourists are beginning to complain of the smell of the sea in what should be prime swimming and scuba diving waters, as well as of rashes they are finding on exiting the water. This was a common response across several interviews. Other scuba diving professionals that took part in the research interviews stated that 10-20% of repeat customers were starting to look toward resorts beyond the Mexican Caribbean for their next vacation, due to the declining quality of the coral reef they had been coming to see year-after-year. The link between marine pollution and coral death in the region is one that is certainly well known to local scientists . 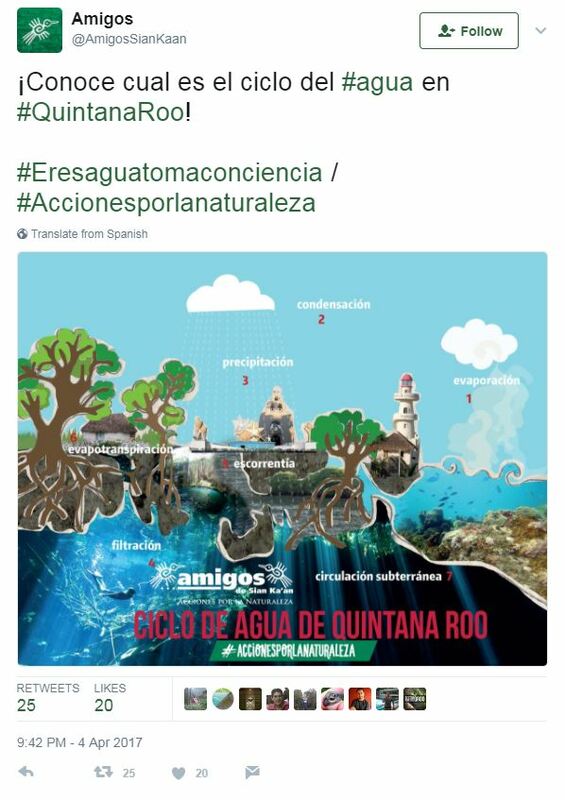 The reason water quality is such an issue in the Playa del Carmen region is illustrated in the following tweet from Land2Coast project partner and environmental NGO, Amigos de Sian Ka’an. It isn’t just as simple as pointing to the fact that the region is not treating its wastewater as comprehensively as it could. The problem is as deeply rooted in the geology of the region. The Yucatan Peninsula has a unique limestone landscape where water enters the ocean, not primarily in overland rivers and groundwater as is typical in most regions, but via underwater rivers carved in the porous rock following past periods of erosion. These underwater rivers, into which much of Quintana Roo’s wastewater is injected untreated, do not provide the same opportunities for filtration and cleaning. The water in them does not drain through extensive soil systems that would act to clean the water, and the rivers’ mouths are not at the coastline. Instead, the mouths of the rivers rise right below the region’s coral reefs, subverting other coastal ecosystems that would usually filter polluted water, such as mangrove forests. So, given the untreated water and the limestone geology, it’s easy to see why conservationists and marine tourism workers in Playa del Carmen are very much afraid that their coastal waters are unsafe. At what stage will tourists say “enough is enough” when it comes to bathing in water that will likely make them pretty sick? And for those working in the lucrative bull shark diving industry, when will the sharks themselves start to feel unsafe in the water? Like humans, bull sharks will avoid polluted waters . In addition, they rely on ecosystems like coral reefs for a safe supply of food . If the coral reefs die off due to the levels of pollution, taking the sharks’ food with them, then the sharks will not be able to survive. They too would have to leave the resort, meaning the end for the local shark diving industry. Over the next year, the Land2Coast research team will be working with institutions and individuals in Quintana Roo to find an approach where the impacts of land use on the marine environment are better considered in urban planning and regional policy-making, in order to help safeguard industries like the shark diving one in Playa del Carmen. You can follow the progress of the Land2Coast research team at their institutional and project websites, as well as by following Twitter updates. Land2Coast is a research collaboration between Cardiff University, The National University of Mexico (UNAM), The College of the Southern Border (ECOSUR), and Healthy Reefs for Healthy People. C. Neff, The Jaws Effect: How movie narratives are used to influence policy responses to shark bites in Western Australia, Aust. J. Polit. Sci. 50 (2015) 114–127. L.S.C. Charles Q. Choi, How “Jaws” Forever Changed Our View of Great White Sharks, Live Science. (2010). http://www.livescience.com/8309-jaws-changed-view-great-white-sharks.html (accessed May 26, 2017). G. Vianna, M.G. Meekan, D. Pannell, S. Marsh, J.J. Meeuwig, WANTED DEAD OR ALIVE? The relative value of reef sharks as a fishery and an ecotourism asset in Palau, (n.d.). http://www.pewtrusts.org/~/media/assets/2011/05/02/palau_shark_tourism.pdf. A.J. Gallagher, N. Hammerschlag, Global shark currency: the distribution, frequency, and economic value of shark ecotourism, Curr. Issues Tourism. 14 (2011) 797–812. S. Ilner, Bull Shark Diving, Revolve Media. (2016). http://revolve.media/bull-shark-diving/ (accessed May 26, 2017). Land2Coast, “Land2Coast” Workshop Reports 30-31 March 2017, Land2Coast, 2017. https://land2coast.files.wordpress.com/2017/05/workshopreportforstakeholders.pdf. Healthy Reefs for Healthy People, Mesoamerican Reef: an evaluation of an ecosystem – 2015 Report Card, Healthy Reefs for Healthy People, 2015. http://www.healthyreefs.org/cms/wp-content/uploads/2015/05/MAR-EN-small.pdf. National Wildlife Federation, Bull Shark, National Wildlife Fedaration. (2017). https://www.nwf.org/Wildlife/Wildlife-Library/Amphibians-Reptiles-and-Fish/Bull-Shark.aspx (accessed May 31, 2017). M. Espinoza, M.R. Heupel, A.J. Tobin, C.A. Simpfendorfer, Evidence of Partial Migration in a Large Coastal Predator: Opportunistic Foraging and Reproduction as Key Drivers?, PLoS One. 11 (2016) e0147608.